Roof tiles and slates often look weather-beaten and dull after a couple of years. Thanks to a coloured or transparent roof coating, you can give them a brand new and fresh appearance. Moreover, the coating protects the roof tiles from damp. In this article, you can read more on the advantages, price, types of coating and the working method. Why have your roof coated? Roof coatings help to maintain the look of your roof and they protect it against weather influences. As a roof suffers a lot from the weather, roof tiles and slates become porous over time. This porosity leads to little cracks, as a result of which damp can penetrate the surface. Consequently, lichens (mosses) and algae will be able to stick to the surface faster. In order to keep your roofing neat, you can remove the moss sometimes or have your roof cleaned. However, this should not be done too often! Otherwise, the roof will eventually become even more fragile. You can avoid this by protecting the roof with a qualitative roof coating after cleaning. This way, your roof will be protected for years. The house gets a completely new appearance. It even seems as if a new roof covering has been applied. 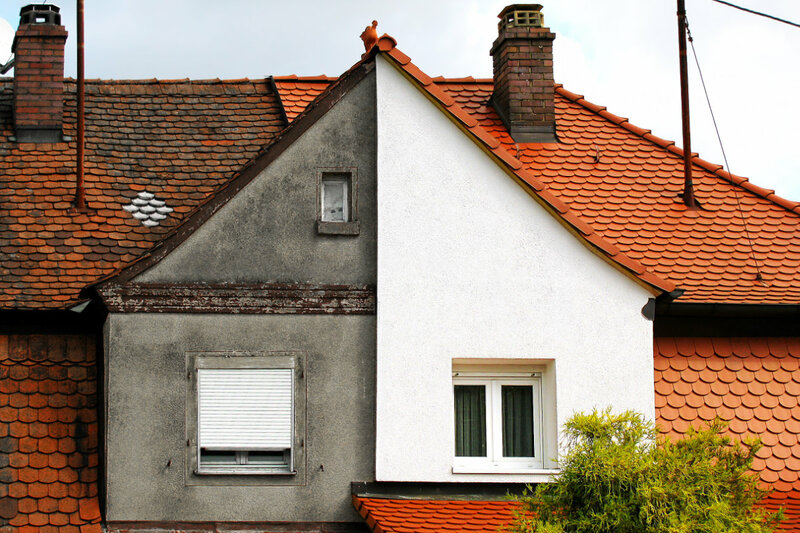 Cost-saving: the old tiles or roof slates do not have to be replaced. The roofing is well-protected against penetration of damp, but it is still able to breathe. The protective layer is vapour permeable. The value of your house will increase when the roof has been coated. As every single roof is different, the costs for having a roof coating applied depend on several factors. Think, for example, of the roof’s accessibility, the angle of inclination and the surface of the roof. A steep roof is not walkable and requires extra equipment or other resources. Consequently, the price per square metre will be slightly higher in this case. On average, you will pay between 25 and 40 pounds per m² in order to have a pitched and tiled roof cleaned and coated. Curious about concrete prices for your specific situation? Request customised quotes from various cleaning specialists in your region. This service is entirely free and non-binding. A roof coating is applicable on almost every roofing material. Do you have a porous roof covering, like concrete tiles? There are special coatings available which thoroughly penetrate the surface and have a moisture-repelling function. In case you have artificial slates or ceramic roof tiles, you can use coatings which have a double function as well. They are aesthetic and also protect the tiles against damp and the growth of algae and moss. Old artificial slates which contain asbestos cannot be coated. Cleaning is essential in order for the coating to adhere well. However, according to the law, asbestos-containing slates may not be cleaned. Various special roof coatings are available and each of them has a specific function. You can, for example, choose a reflecting protective layer which reflects all the sun rays. This way, the house will remain cooler during summer time. You can also obtain a special rubber roof coating with crack-bridging properties. These types of coatings are flexible and resistant to big temperature differences and UV-rays. You do not necessarily need such a special coating; the standard acrylic coatings will usually do just fine. You would be well advised to gather advice from the company that is going to carry out the job. On the quote page, you can contact recognised professionals and receive quotes for free. Before the roof can be coated, it needs a thorough cleaning. How this is done depends on the roof type and the type of roofing. Usually, however, one uses a cleaning agent and a high-pressure cleaner. 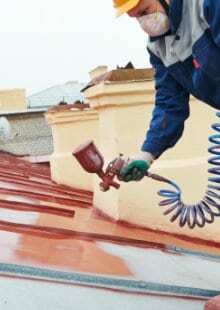 As soon as the roof is clean and dry, one can start coating the roof. The coating is applied onto the roof in two layers. This can either be done with a paint brush or a roller. 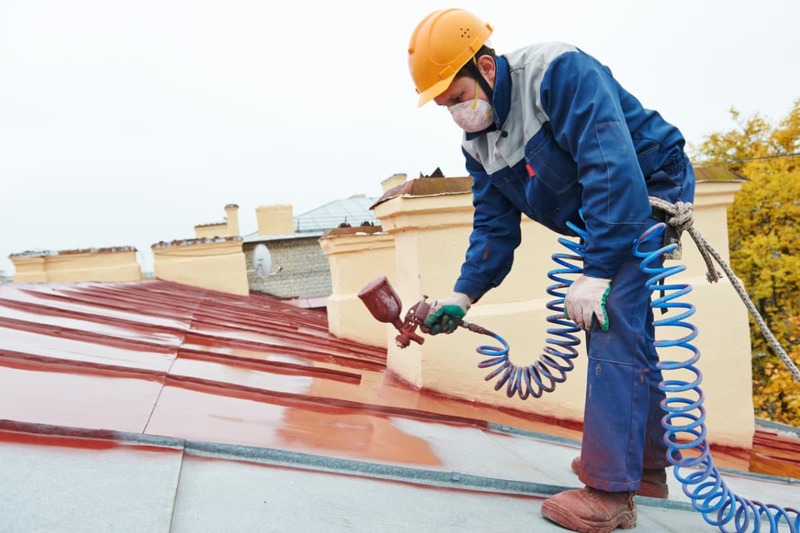 Depending on the type of roofing and its condition, it is also possible to spray the coating onto the roof with an airbrush. Note that the paint needs to dry a few hours between applying layers. In fact, you can coat a roof in every possible colour. Popular colours are anthracite, aluminium grey, black, pale red, burgundy red or even royal blue. You can choose a matt finish or a finishing with a silky shine or high gloss. The coating usually exists of a high-quality acrylic paint, combined with special additives which protect the roof against damp and filth.